Versions of this story have been retold by countless cultures and religions throughout human history, but the moral that the whole truth can lay beyond a single man’s experience is a universal lesson. Just like the blind men in this story, many of us still struggle to understand the true nature of elephants: they are many things to many people. To those who make their living on the land, elephants too often feel like villains. They perpetrate midnight crop raids, destroy property and injure friends and family. Those in the conservation world feel that elephants are the undeserving victims of the global ivory trade, habitat loss and senseless retribution killings. For the millions whose livelihoods depend on ecotourism, elephants might be called heroes, having weathered more than their fair share of insults to unknowingly provide opportunities for their human neighbors. For me, they are a boyhood fascination that turned into a scientific curiosity. Even among scientists, though, there is little consensus about elephants. Dozens of studies throughout Africa have reported negative impacts of elephants in savanna ecosystems: they tear down trees, trample plants and compete with domestic livestock. These same behaviors, viewed in a different light, have been interpreted by other scientists as creating habitat for arboreal vertebrates, maintaining game trails through thick brush, and increasing the accessibility of forage for smaller herbivores. On one topic, though, scientists are in agreement: elephants play a crucial role in savanna ecosystems. They are quintessential ecosystem engineers, modifying their habitat in ways that impact nearly every other species in their ecosystem. 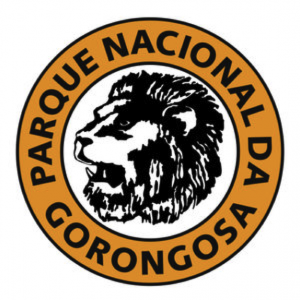 For this reason, they are also central to the conservation and restoration of Gorongosa National Park. 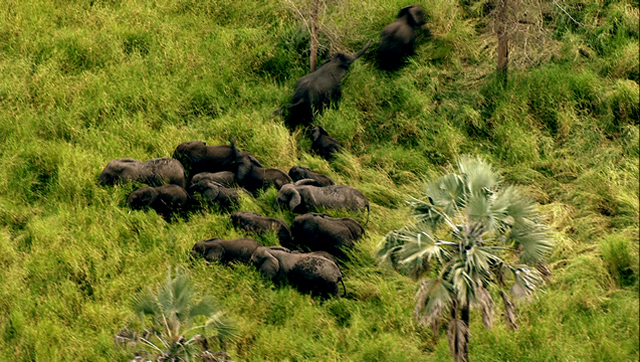 Prior to the 1977–1992 civil war there were nearly 2,500 elephants within Gorongosa’s borders. After the war, fewer than 1 in 10 of those were left alive. When I arrived at Gorongosa in 2013 as a first year PhD student with Dr. Rob Pringle at Princeton University, I wondered whether the Park’s few remaining elephants could still have any effect, positive or negative, at such reduced numbers. My colleague Josh Daskin, thinking along similar lines, set out to determine whether the near absence of elephants over nearly three decades would mean fewer toppled trees and more forest encroachment. To complement his largescale efforts, I chose to explore a potential benefit that elephant-toppled trees might provide at a much smaller scale. Watching an elephant topple a fully grown tree is an awe-inspiring experience: the sounds of tearing earth, snapping roots and elephant trumpets mix in a crescendo that reaches a climax only when the tree bends past the point of no return and drops forcefully to the ground. Standing nearby, you can hear branches breaking and bark peeling as the elephant dismantles the tree, ignoring the many thorns and spines that protect it from other herbivores that lack the elephant’s thick skin. 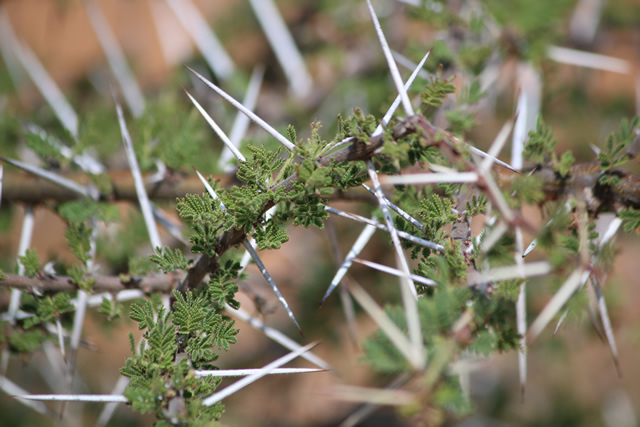 In the wake of these episodes, thorny branches and broken limbs can be found scattered around the base of trees, partially covering the grasses and forbs growing beneath. Far from harming the plants, though, these branches appear to protect them from other herbivores like bushbuck, nyala and kudu. I surveyed the plant communities beneath broken branches and found that they harbored nearly 25% more species and 50% more biomass than unprotected areas. Over the next several weeks, I set up two experiments to investigate this pattern further. Channeling my inner elephant, I used a small hand saw and pry bar to break dead branches from trees, mimicking with difficulty the damage that elephants make look so easy. 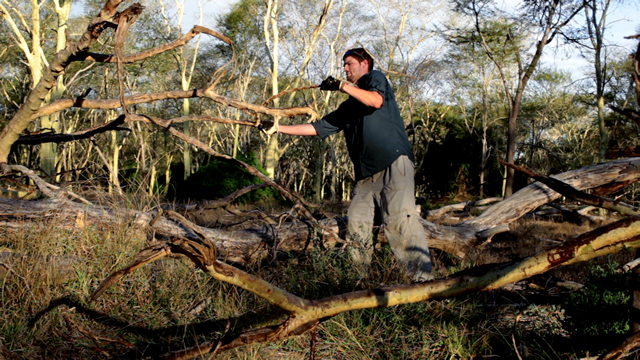 I also removed broken branches from trees that had been damaged by elephants years ago, exposing the underlying plants to other herbivores. A year later I checked back on the experiments and was surprised at what I found. Where I had added damaged branches beneath trees the diversity and biomass of the understory plant community had increased dramatically. There were more species after only one year and they had grown to fill the space beneath the broken branches. Some of the new species were ones that I never found outside broken branches, suggesting that they were dependent on elephants and the refuges they create. In contrast, the plants that I had exposed only a year ago where nearly gone, their stunted remains evidence of a year of grazing by small herbivores. The results were clear: understory plants benefited from damaged branches and elephants were at the center of this interaction. These experiments, though, are only one part of the elephant story at Gorongosa. If we are to learn from the allegory of the elephant and the blind men we must take into consideration all of the many roles that elephants play. A recent survey found that the Park’s elephant population has continued to grow following the first post-war census, reaching 535 individuals by the end of 2014. This resilience in the face of so much adversity suggests that we ought to add another name to the already complicated description of Africa’s elephants: survivor.